The Bluetooth® Low Energy (BLE) physical layer (PHY) contains the analog communications circuitry responsible for translation of digital symbols over the air. It is the lowest layer of the protocol stack, and provides its services to the Link Layer. The 40 channels are divided into 3 Advertising Channels (Ch. 37, 38, 39), and 37 Data Channels (Ch. 0-36). When transmitting data, the BLE radio transmits at 1 Mbps, with 1 bit per symbol. The radio is optimized for sending small chunks of data quickly. BLE protocol overhead limits overall data throughput to significantly less than 1 Mbps. 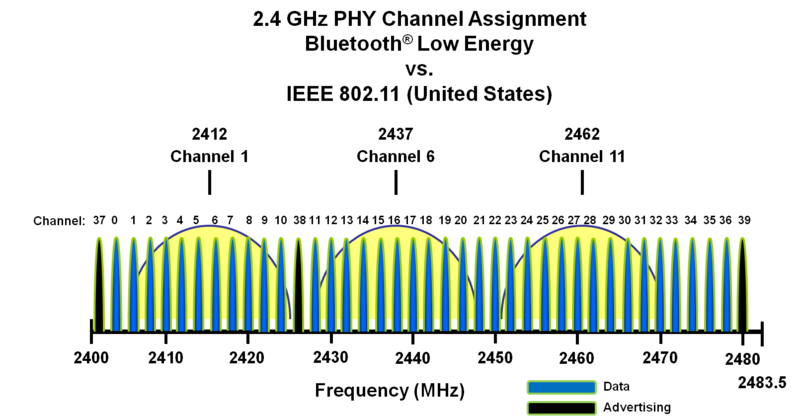 The BLE radio uses Gaussian frequency-shift keying (GFSK), whereby the data pulses are filtered with a Gaussian filter before being applied to alter the carrier frequency, in order to make the frequency transitions smoother.